One romance artist I really like, but don't talk about as much as I should, is Jack Abel. Primarily an inker on the romance comics, his work always seems to add a little something special to a story. Jack occasionally went by the pseudonym Gary Michaels, which was his son's name. Today's story, "Love Wears No Uniform!" from Career Girl Romances #73 (February 1973) is by Jack and his pseudonym-sake son, Gary. I couldn't find much on Gary Abel, and it is not clear whether he wrote this story and Jack illustrated it completely, or if Gary penciled it and Jack inked it. Either way, it is quite the rarity! This invaluable resource on Charlton personnel lists Gary as having only done one romance story with his father (Teen-Age Love #88), but as you can see today, there are at least two out there! Enjoy this little gem! Susan Peters is a newly minted officer on the force. Becoming a cop has been a life-long dream of hers, as well as getting married. She dates a lot of fellow officers, but ultimately decides that she would rather date someone not on the long arm of the law. One evening, Officer Peters goes to a civilian party in hopes of meeting an eligible young bachelor. She is approached by a handsome guy named Steve. They seem to hit if off right away and naturally, he asks what she does for a living. Unfortunately, her livelihood is met with some resistance and Steve flees the scene of the short-lived romance. Things start to look up for Officer Peters at work, and she is assigned to a special plain clothes assignment guarding a famous television star at his hotel. Except, it isn't really a plain clothes assignment -- she has to pose as the star's maid. Nick Jones, the star turns out to be a jerk, but his friend Bill Downs is quite nice. Susan and Bill go on a date and quickly fall in love. However, Bill has a confession to make... ooh the suspense!!! Bill is not really a friend of the television star, but a detective assigned to the case as well! 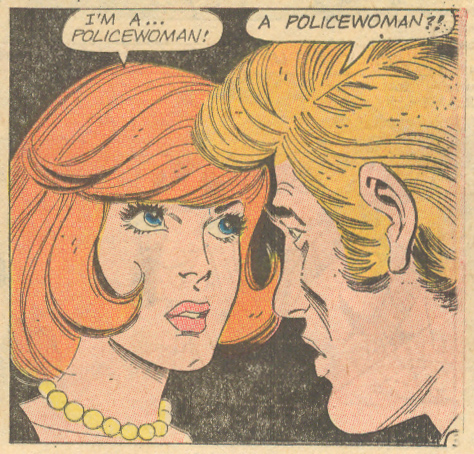 Our Charlton version of Lady Cop decides she is cool with that and lets Detective Downs know with a kiss! I really enjoy the wide-eyed cuteness of Jack Abel's art, and the addition of his son (in whatever capacity) makes for a nice little story.